The registered manager and has 15 years of continuous service within the National Health Service and Local Government Social Services. 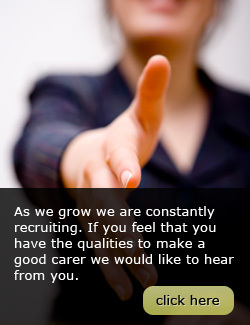 She has experience working with older people and people with long term conditions. She has undertaken a vast amount of work on care pathways and models of care packages for older people, as well as developing roles and training programmes for support workers. She has undertaken projects at local and regional level on managing and implementation disabilities and mental health strategies. Homecare workers upon appointment will be required to undertake initial induction training, to introduce them to the organization and its philosophy of care, aims and objectives, policies and procedures. All Homecare workers within six months of commencing employment are required to register for their NVQ in Care, which should be completed within twelve months. Other specialist needs, Dementia Care and Palliative Care. Copyright © 2011 Homecare4u. All rights reserved.